From restaurant ranges and convection ovens to char broilers, fryers, and griddles, MPM Food Equipment Group offers a full range of cooking equipment to furnish restaurants, fresh markets, commissaries, and more (including supermarkets). So whether you need combi oven systems and steamers or blast chillers and pizza prep stations, we can get you the right piece at the right price. If you would like to find out how MPM can partner with you, call us at (847) 297-6762 or toll free at (800) 976-6762. 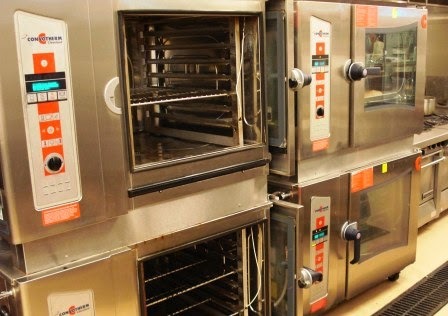 MPM Food Equipment Group gets some Combi Ovens ready for a delivery. The professionals at MPM have a depth of knowledge on each of our manufacturer’s product lines. And we represent the finest cooking equipment manufacturers in the business. Our fryer brands include Frymaster, Dean, Vulcan, and Pitco. The manufacturers of our restaurant ranges include Garland, U.S. Range, and Southbend. Blodgett, Garland, and Vulcan are some of the brands for our convection ovens. Providing you with the right pieces of commercial equipment at the right prices is at the heart of what we do. Since we have put in many years of sales and service of these quality products to the marketplace, we understand how these models are made, how they work, and the pros and cons of each. The manufacturers of our steamers include Cleveland, Accutemp, and Southbend. Our pizza deck ovens have brands such as Blodgett, Bakers Pride, Marsal, and Woodstone. Our char broilers and griddles include such brands as Vulcan and Garland. And our holding and warming products include such brands as Hatco, Cres Cor, and Alto-Shaam. Whatever your cooking equipment needs, MPM has a solution. Look for our rotisserie ovens, cook and hold ovens, deck ovens, conveyor ovens, pasta cookers, steam kettles and skillets, oil filtration systems, rice cookers, stock pot ranges and hot plates, induction ranges, sandwich grills, crepe machines, mobile cooking carts, and butane stoves. Heck, we even carry hot dog equipment. Our goal is to provide the highest quality products and to follow that up with the highest quality service. Contact MPM or call at (847) 297-6762 or toll free at (800) 976-6762.